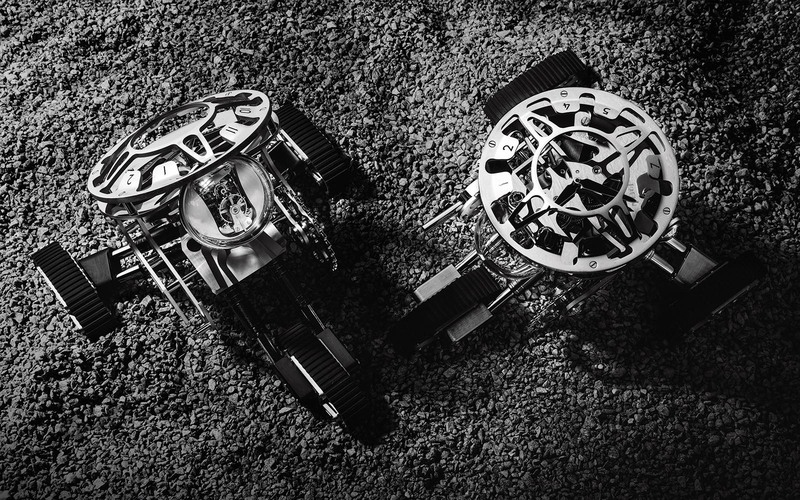 The extraordinary imagination of MB&F has produced some of the most elaborate timekeeping contraptions, from spaceships to creepy crawlies. Needless to say, robots have been a recurring subject, starting with the brand’s first clock, Melchoir, and continuing with the schizophrenic Balthazar to the benevolent Sherman. 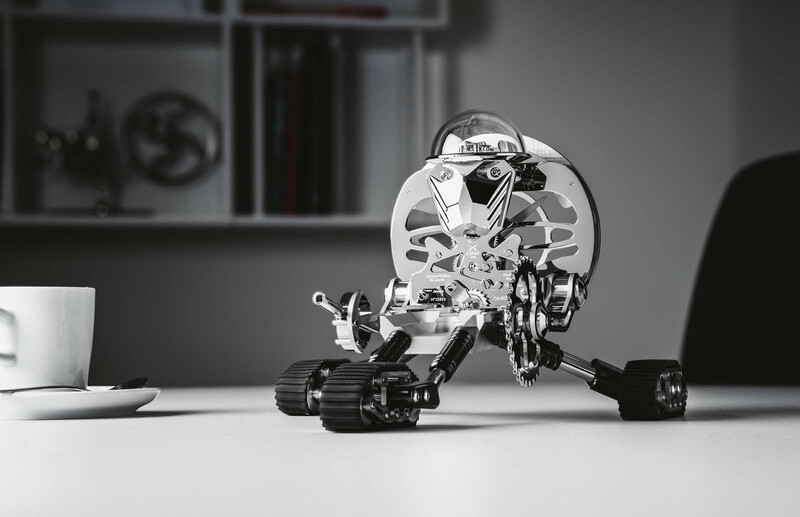 And now MB&F has introduced Grant, a robot clock sitting on three wheeled tracks that can transform. 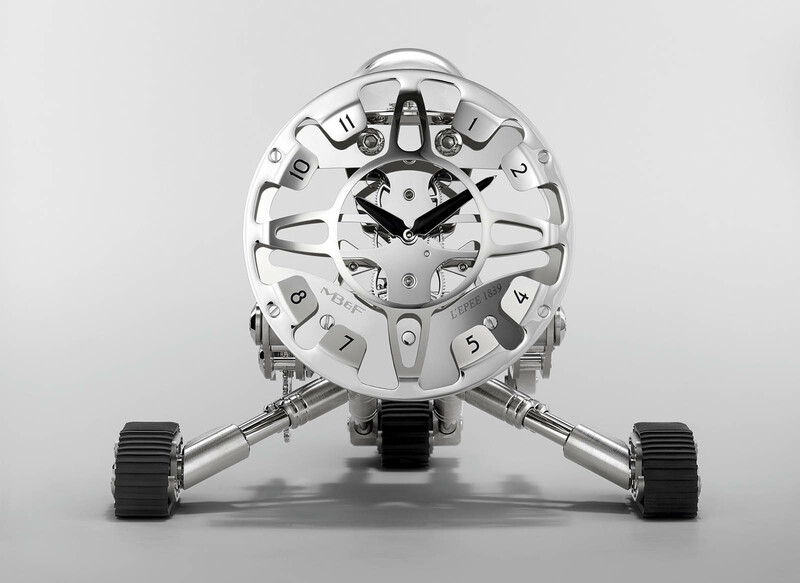 Named after the American M3 Lee “Grant” tank of the Second World War, the compact but weighty 2.34kg clock is designed by MB&F and once again built by Swiss clockmaker L’Epée 1839. Fashioned from steel, nickel-plated and palladium-plated brass, Grant stands on three continuous rubber tracks and is made from 268 components. Grant is powered by L’Epée’s in-line eight-day movement, with time displayed on a shield across its back. 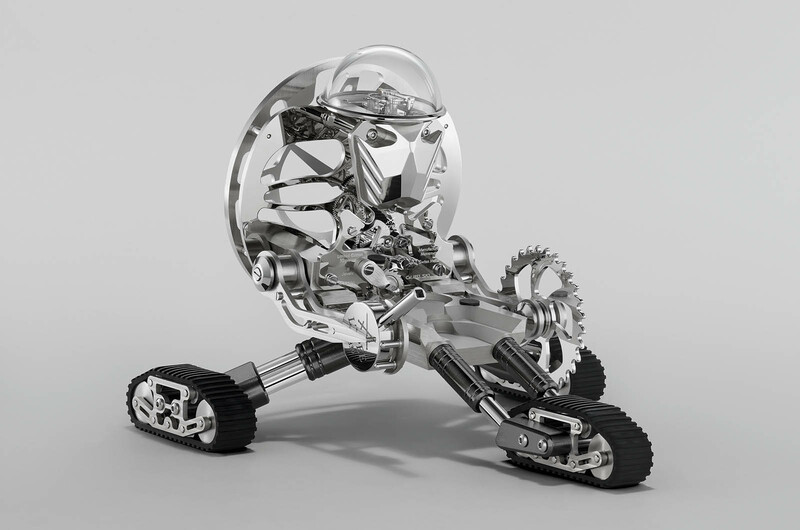 Like the previous robot clocks, it has a glass dome on the robot’s head that protects the balance and escapement. The regulator is equipped with an Incabloc shock protection system to reduce risk of damage when the clock is moved. The movement is wound on the dial side of the clock with a double-depth square socket key, which is mounted on the robot’s right hand, doubling up as a cannon. 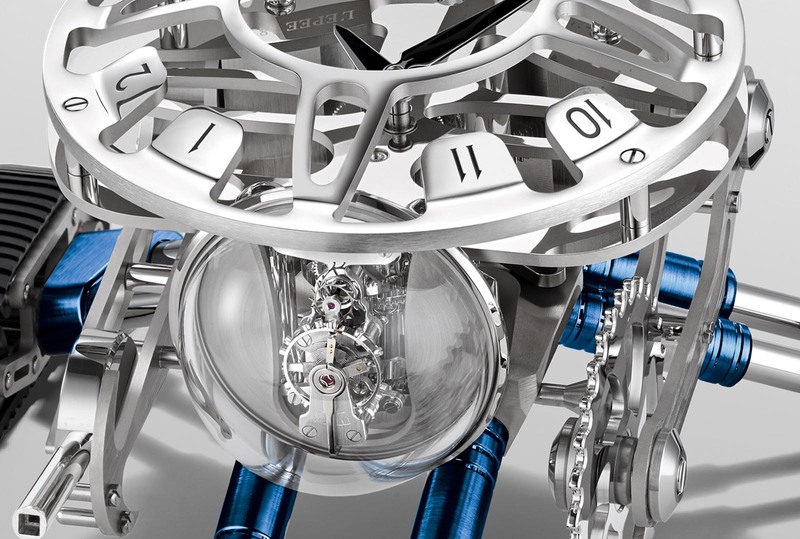 However, what distinguishes Grant from MB&F’s earlier robot clocks is its ability to transform. In its lowest position, the dial is horizontal and almost parallel with the table. The dial can also be set at 45 degrees for an optimal viewing angle as a desk clock, and also vertical at 90 degrees. Grant measures 166mm tall at its tallest standing position, and just 115mm high when flat. Grant is priced at SFr22,200 and is available in Nickel, Black, and Blue, each limited to 50 pieces.